✍✍✍ WHY CHOOSE SUNFUNY 3D PEN? An amazing 3d pen set that can enjoy hours of fun with your family! Comes with abundant 3d pen accessories and durable 3d art pen, it's a perfect gift for your family and friend- Christmas, New Year, Valentine's Day, Birthday, Festival Gifts! ☆Stepless speed control: better control the flow of filament, no worry about flowing too fast, destroying your model! ☆Extrude smoothly: load and upload smoothly without any clogging. ☆LED screen: clearly shows the temperature and filament mode that you control. ☆Safe: Nozzle patent, heat dissipation and auto sleep function, safe for kids. ☆Humanized design: Large operation button, ergonomic handle provide pleasant doodling experience. Comes with most abundant 3d pen accessories! 【ABUNDANT 3D PEN SET】 - You get not only a 3D printing pen! Package comes with abundant 3D accessories: 15 colors 150 feet PLA filament, 3D DIY model removal tool, carrying case, pen holder, PVC drawing board, 3D stencil. We also offer e-books stencil, if you need, please contact us by email. 【ADJUSTABLE TEMPERATURE & STEPLESS SPEED】 -Two mode and temperature adjustable: PLA(160-210℃) or ABS(210-235℃). Unlike other 3d modeling pen with low, medium, high speed adjustment, Sunfuny 3D doodler has stepless speed function, better for slower detail work or faster infill work. 【EASY, NO CLOGGING & SAFE】 - Adjust mode & temperature, plug in, preheat then drawing 3d craft without clogging. Great for beginners. Ergonomic handle and larger button make it comfortable for 3d doodling. Ceramic nozzle and auto sleep function ensure safety. 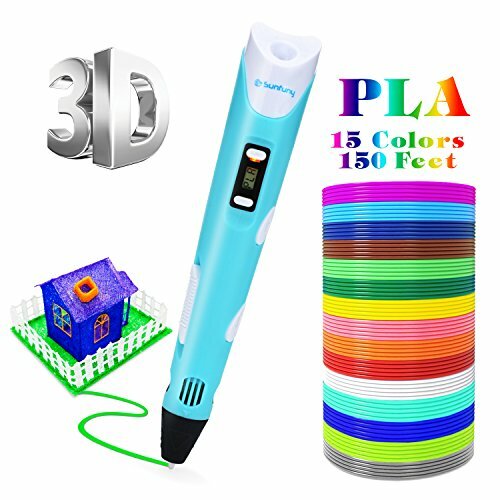 【GTEAT KIDS TOY】 - Sunfuny 3D doodling pen is a perfect gift for kids to improve their spatial thinking with funny 3d doodling. It's also a great way for parents and children to spend quality time together.